The Superman Fan Podcast: Episode #384 Part IV: Superman Family Comic Book Cover Dated July 1965: Superman's Pal Jimmy Olsen #86! Interestingly, in this issue, Superman doesn't save Jimmy in any of his adventures. 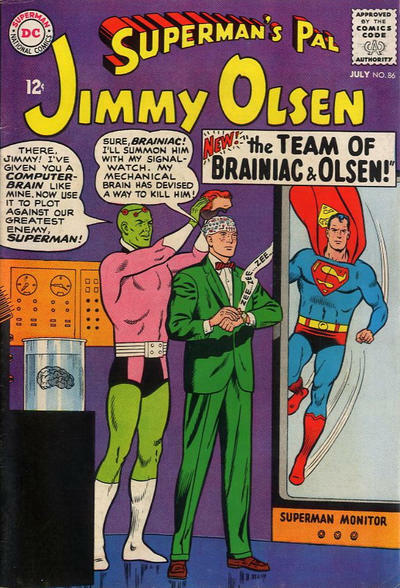 Granted, the third story, "The Team of Olsen and Brainiac! ", we don't yet know the conclusion of the story (which I'm eagerly looking forward to), but, so far, Superman has not been Jimmy's "genie" this time. In "Jimmy's D-Day Adventure", I would have been creeped-out to see a movie of a high-ranking Nazi who looked exactly like me, and, even if I could travel back through time, I don't think I'd have wanted to meet that person. I would never have had confidence in myself to be able to maintain my cover in such a high pressure situation.